Today we explore 10 ways you can generate extra income to save your deposit or grow your property portfolio faster. This is Day 5 in the 30-Day Property Journey. Over the next 30 days I’m helping you become a more confident investor by doing activities and taking steps that move you toward your goal of buying an investment property. Yesterday we talked about creating your deposit savings plans and today we’ll explore ways to generate extra income. One of the things that I recommend when looking at saving a deposit is saving the deposit up front. The first thing you do with your money as soon as you receive it is put it away as your deposit and then either work to live off the rest or make more money so you can live comfortably. What I want to do is cover some different ways that you can potentially earn extra income to save your deposit in the way you want or to increase your serviceability on properties so that you have more income and can invest faster by servicing more loans. I am not professional at doing this so I’m not going to go into great detail on it. However, I am well aware that people just don’t get the raises that they deserve and companies are often so fixated on managing costs that they hold on to employees as long as they can, as cheaply as they can and very rarely give raises. Usually if you get a raise it will generally only be about 2% or 3% to keep up with inflation. I will say that getting a raise for doing the same job that you’ve always been doing probably isn’t going to happen. In order to get a raise you are going to need to step up your game and do something that will differentiate you from other people in the workplace. A person that I consider the best to talk to about this subject is Ramit Sethi. You can find him at I Will Teach You To Be Rich and he actually has a course that teaches people how to ask for (and get) a raise. There have been a couple of times in my career where I’ve gotten a raise because I asked for it. One time the raise was pitiful and I was very upset. Another time I got a raise well above my peers because I was outperforming them in many areas. The better idea that I think can work is to change jobs and get an increase that way. I find that when you are at a company you are limited in how much you can get. Larger companies especially limit certain roles that you have and how much they will pay you for your duties. And then in smaller companies, even if you get in at an entry role and work your way up the ladder they might still see you as that entry-level person. By making the move often times your skills are worth more in another company than the company that you are currently in. I would explore the job market to see what’s available. It would be beneficial if you could get a job that is going to pay you more money because I think it is a bit depressing to stay in the same job all the time and not be earning as much as you possibly could. Truthfully the more you earn, the faster you can advance your property career. Then you can grow your passive income and hopefully earn your financial freedom faster. I have also found that often when you go to jump ship your current employer will try to give you more money to get you to stay. This happened with me. My income was $30,000 at one job. I got another job offer that was $45,000 plus commissions so a potential $60,000 in income. I wanted to leave and my employer who was paying me $30,000 offered me $55,000 if I stayed. So a $25,000 jump in income for doing not much. I didn’t stay and I wouldn’t really recommend that someone stay because the statistics show that if you stay after you have been offered more money generally you leave within the next 6 to 12 months anyway. The same thing happened to my sister. She was offered an extra $15,000 when she got a new job and she ended up leaving as well. It just goes to show that you are probably worth more than they are paying you. To do this you could either go into a job where you have an effect on hitting the bottom line by saving money or the top line by making more money and therefore you can get the ability to earn commissions. In my last job before I went into business for myself, I worked as a sales rep with a large pharmaceutical company and my income was about 60/40. That means that 60% of my income was a regular wage and 40% of my income was commissions (which were almost always made). That was a great way for me to live off the income that I generated and I would use those commissions to pay off debt and save a deposit. Earning commissions can therefore be good. If you are in a role that’s a service role and you don’t actually have a direct effect on savings or on earnings then it’s going to be hard to earn commission. But if you are in one of those roles and you are not currently getting commission then maybe you could try to organize a commission structure with your employer. Before I was a sales rep I was in procurement so I was buying stuff and saving my company a lot of money, hundreds of thousands of dollars per year. Because of that I was able to negotiate a small commission on those savings. I actually hate this strategy but it is possible that some people may like this option. Working a second job on a Saturday or a Sunday can be good when you get double time. However I just find that I prefer to work smarter not harder or at least work on something that I’m passionate about rather than just working a second job you’re not going to enjoy. But if you don’t have any other ideas on what you want to do then working a second job is another option to earn money. Just make sure that you’re saving that money from the second job or you got your deposit-saving plan in place and that second job is just to make sure that you can survive and live happily. I love this idea of starting a side business. It’s something that you can do on the side in your spare time to grow some extra money. There was a guy who used to come around to my parents’ place back when I was a kid and mow the lawns. He actually worked in the oil refinery and made a decent income. What he did he was build up this lawn business on the side by working in the afternoons after work or working on the weekends. 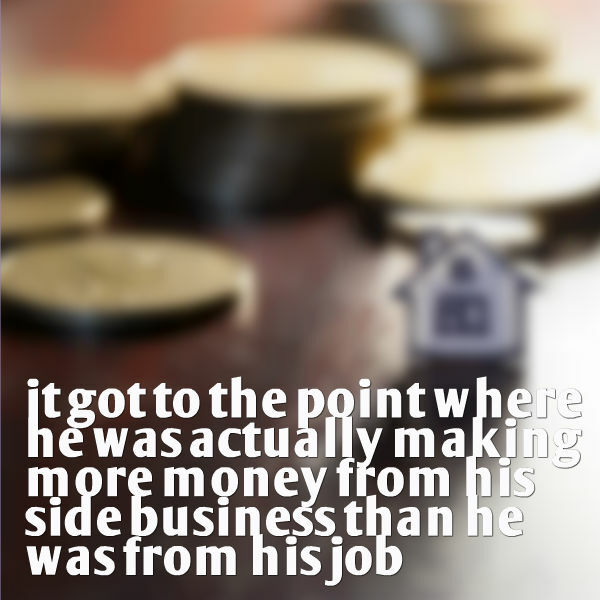 I think it got to the point where he was actually making more money from his side business than he was from his job. 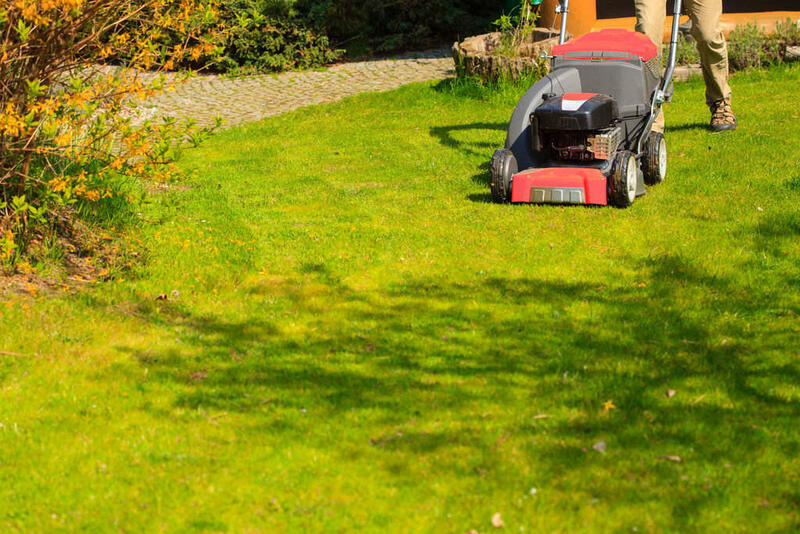 Having a lawn mowing business or some sort of service business, where you can offer people a service in exchange for money, is a good idea. That’s a great way to start up a side business. There is so much on the internet about starting side businesses but I’m not going to go into it in huge detail. This will especially be useful if you work in high level roles and have an immense amount of knowledge that would be valuable to other people’s businesses. I, for example, run my own business where I manage my own websites like On Property and Public Speaking Power. I’ve got a few others on the side and I know a lot about internet marketing, creating web sites, social media and all that kind of stuff. Therefore I could potentially go out and offer consulting services to businesses who can benefit from that. Back when I was a sales rep I did lot of trainings showing people how to sell more of my products. There was a potential for me to do consulting either in that industry or outside of that industry if I really wanted to. I could’ve helped businesses to help their teams be more passionate and sell more efficiently. We just have to package it up and sell it. If you are in IT or you are in some sort of management you could offer something of benefit to other businesses and get them to pay you for it. Obviously you need to be careful with your work and employment contract so that you’re not breaking any of the rules when it comes to consulting. This is what I did with my time when I was working full time. I loved online businesses for some reason. I tried many different online businesses in the past. I started over 100 blogs in the last 10 years and I have just always been dabbling online. But I got pretty serious when I started On Property which was previously called Cash Flow Investor. I started building that up as well as building up other sites like one that I’ve started about fatigue and another one that’s about audio books. I have an array of little sites that I kind of build-up by writing a few articles on it every so often. By the time I left my job, I was earning around $1,000 per month in passive income from these websites that I’ve traded. So starting an online business can be a great way to generate money on the side. I found that it’s a more long-term strategy though, so if you want more money to pay the bills this month, it probably won’t be the best strategy for you. There’s a big learning curve and figuring out what works for you can take a lot of time. For me, my strategy is much slower as well and the way I make money online is much slower. However, it’s an option you can explore that can be fun on the side. You could either sell things online or at the market. I’ve got a friend at the moment who’s making do-it-yourself designer prints and she sells them in bulk. I helped her a bit with her marketing. I got another friend and his wife was an epic cook. She was the best when it came to baking and would sell her baked goods at markets and shops. Working one day, she would make about $500 or $1,000. They ended up eventually turning that into a full-fledged business by opening a shop. So selling things like that could be a good idea. My favourite coffee is Coffee Kate and she’s at the market once a week with amazing coffee. She must make so much money because there’s always a huge line. Personally, I can’t really make anything besides websites. But making goods to sell online or at the market could be something to explore if you’ve got hands that can work and create sell-able items. This is all about tweaking your consumer spending. Rather than constantly buying things that don’t go up in value, consider buying things that hold their value or actually increase in value. This is going to take a bit of work and you kind of need to be a collector in order for this to work. Basically you shouldn’t buy everything at retail price at the stores. Instead try buying things through second-hand sites like eBay or Gumtree and using your spending in such a way that you could then resell the items for the same or higher price in the future. I just like the idea that you can change your consumer spending so you still get all the fun of buying something new and having something you to play with and all of that sort of stuff but then six months or 12 months down the track you can sell it and you can actually make a profit from it. I remember we did this with our first pram. It was a Bugaboo which is a really expensive designer brand for prams and we paid about $600 for it. Although $600 sounds like a lot for a pram, bugaboo’s brand is very expensive and the design that we got (the Bugaboo Bee) can go for around $1,000 brand new. But we bought it for $600, got it in good condition, used it for six months and then sold it six months later for $625. So we actually got this brand, got to use it for six months and then sold it for more than what we paid for it. Even though we didn’t make a lot of money on it, we got all of our money back so it was like having a free pram for six months. Basically this method is more of a way to pool your money into something that’s sell-able than it is to really increase your income. But if you are really smart then you can increase your income. I know you are trying to invest anyway in property but obviously you need to save a big chunk of cash before getting into the property market. So while you’re saving that money consider investing it rather than just letting it sit idly and doing nothing. Technically leaving it in a bank account is investing it but you are only going to get maybe 3% or 4% per year which isn’t much. You could consider exploring other investment options. There may be things like the stock market. I know absolutely nothing about the stock market so I can’t say much about that. But I do know some people make decent money day trading and other people make money trading the currency exchange. I personally hate all of that stuff which is why I run a property blog. But it might be something that you would enjoy. Another thing you could invest in would be businesses or online businesses. There is this website that I follow and really like called Empireflippers.com. They actually have websites for sale on there and websites generally sell for $20,000. So if you can work out the return on investment of that, you basically get your money back in twenty months if all goes well. Obviously there are risks with that sort of investing. You need to know about online businesses before you jump into that. But that could be an alternate investment strategy. There are so many other investment strategies out there but I don’t really know much about them so I don’t want to go into too much detail about it. There you have it. Ten different strategies that you can explore with different ways to generate extra income on the side so you can save your deposit, invest and hopefully begin generating some passive income faster. Tomorrow we’re going to be looking at how to sell your unwanted items and get some quick wins towards saving your deposit and I’m excited to share that with you.